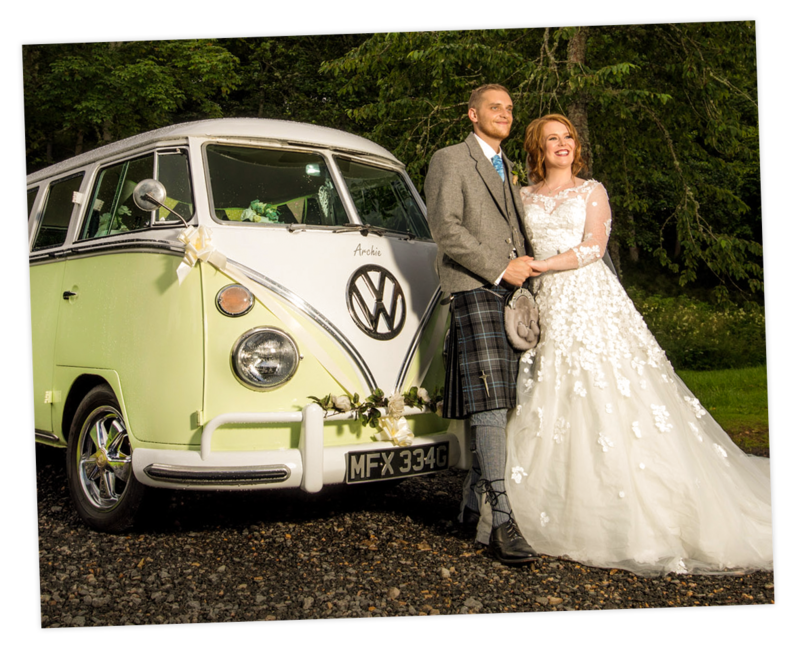 Deeside Wedding Campers – Wedding chauffeur service and vehicles, Aberdeenshire, Scotland. 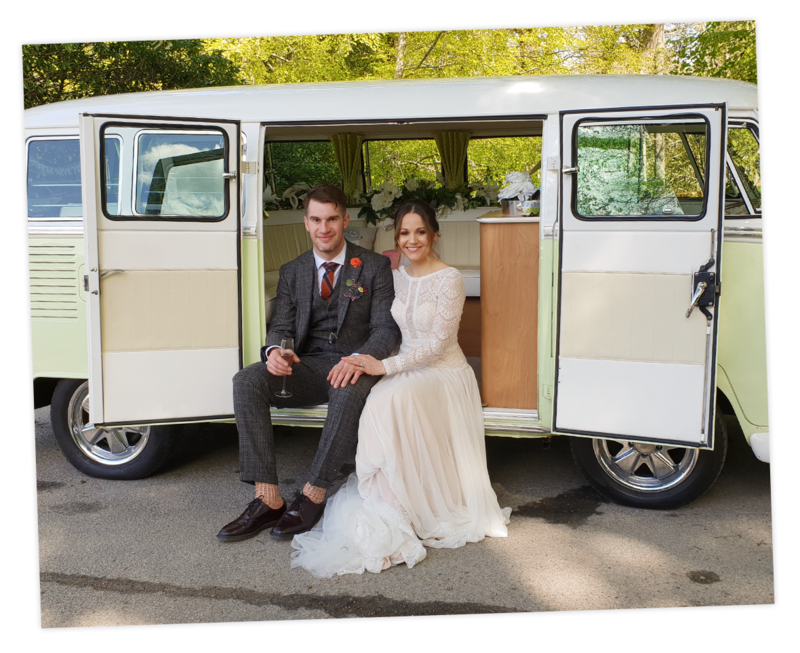 Make a real impression on your big day and arrive at your ceremony or reception in unique style, in one of our stunningly restored and beautifully appointed classic Volkswagen Campers. 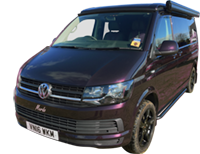 Let us take care of the travel details – We have an organised, efficient and friendly planning process, with stress counselling (if required) thrown in too! 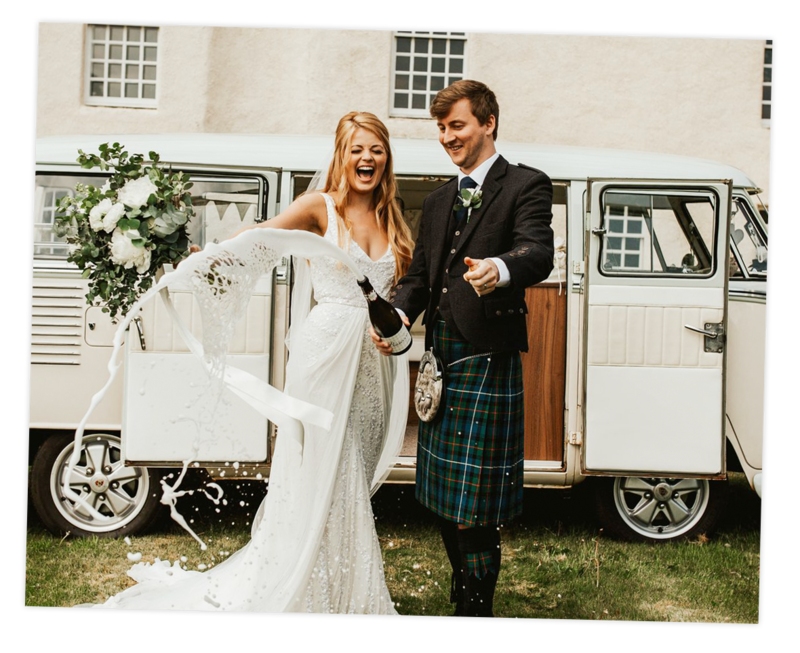 Our campers will be decorated with ribbons and bows co-ordinated with your day and there will be chilled bubbly and spring water onboard too. Our campers are always stocked with tissues, mints, mirrors, plasters, and umbrellas. 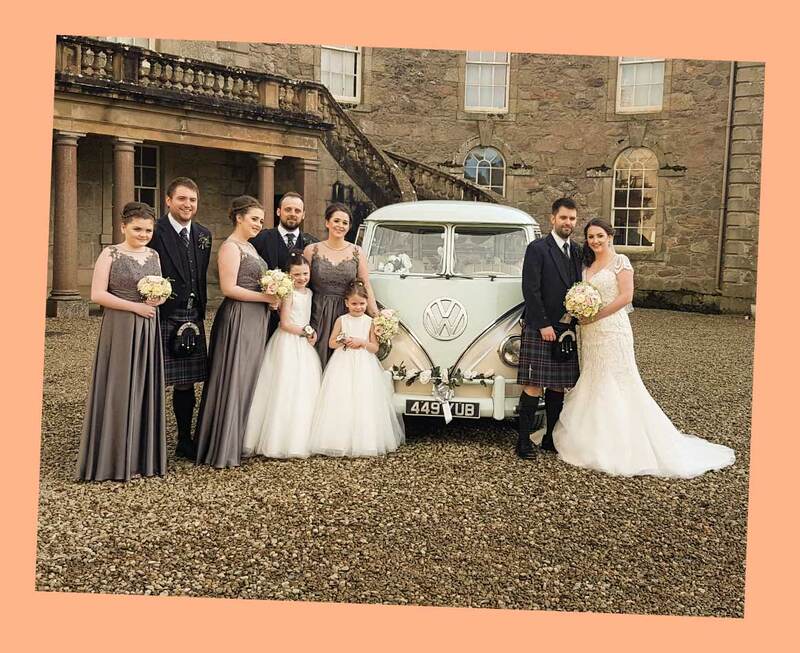 Our experienced and highly-trained chauffeur will be smartly dressed in suit and tie and will go that extra mile to assist you to make your special day run smoothly. 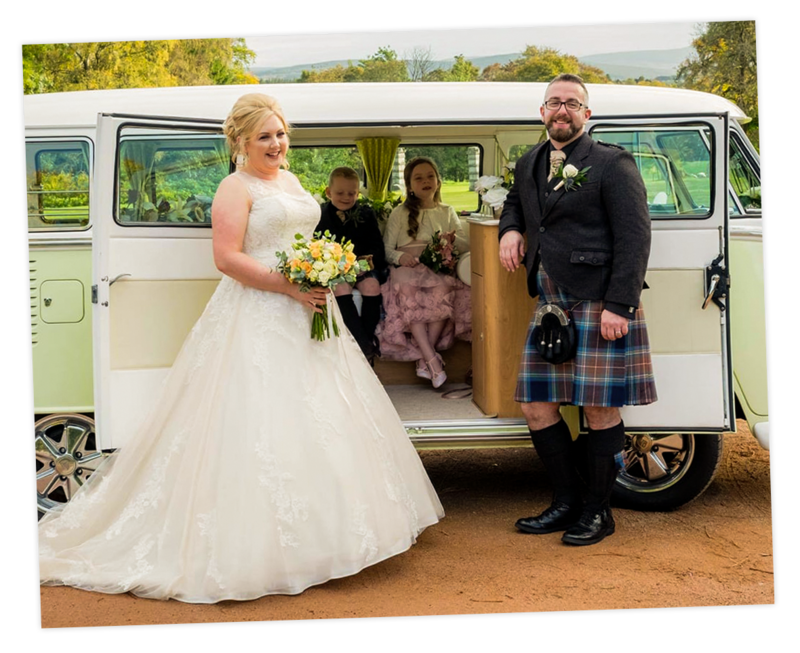 Your VW will pose at the reception for first hour for photos with the wedding party, in addition we can provide photographer’s briefing notes to help your photographer make the most of your day with the VW wedding camper. 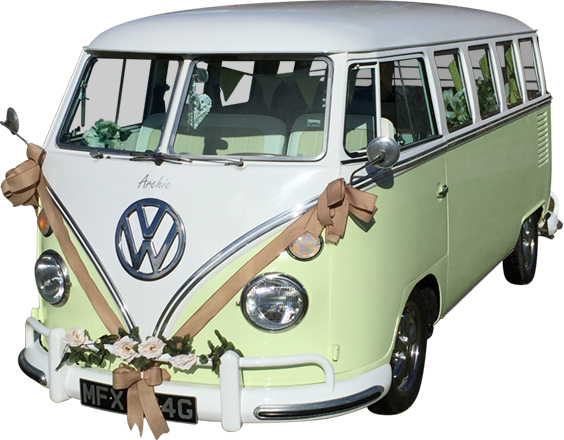 Angus and Archie have been totally refurbished and redesigned as bespoke wedding campers, they can seat up to 6 passengers, and retain many desirable unique and original features such as double barn doors for ease of access for brides, opening safari top hinged windscreens and ten opening side windows. All creating the most luxurious wedding hand crafted interior, including beautiful leather L-shaped seating and champagne cabinet. We have price plans for every budget, each wedding or civil partnership day is priced individually. Prices are for a four hour hire, for a wedding within 30 mile radius (for occasions which are located further away, we have to charge a little more). 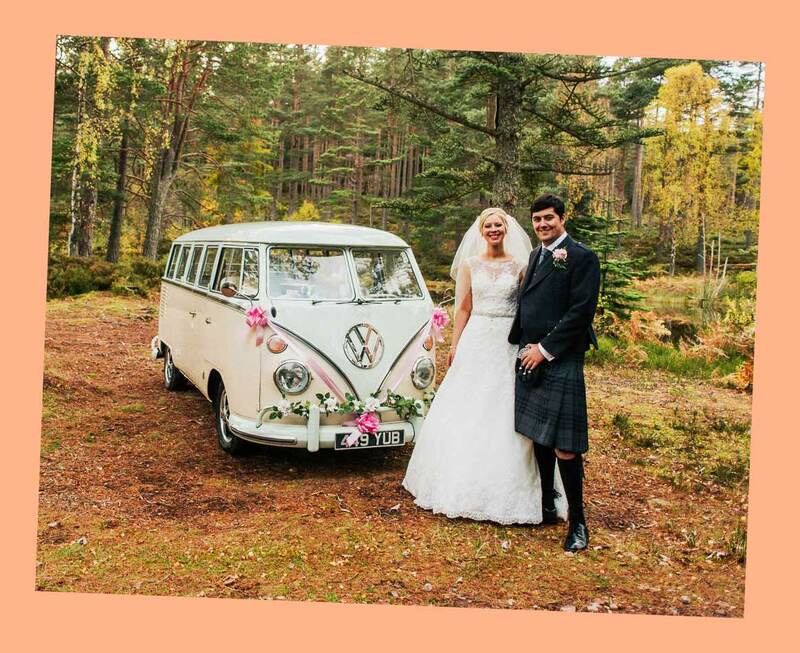 We ask for a £150 deposit to reserve your chosen VW wedding camper. 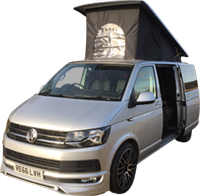 This is higher if you reserve more than one camper van. 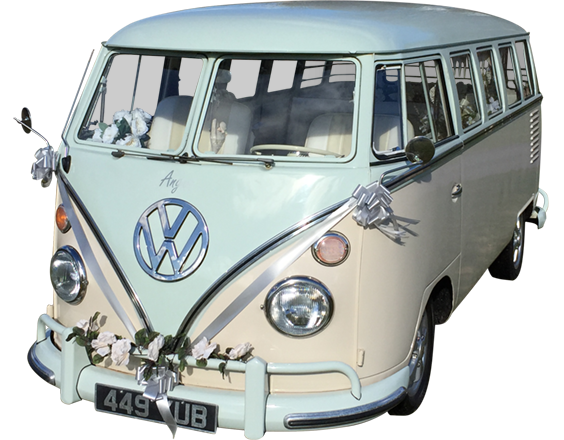 Should you choose to invite 2 or 3 campers to your wedding, we can offer you a multi-vehicle discount. The outstanding balance is due 6 weeks prior to your wedding day. We have easy payment options – including credit or debit card and over the phone payment. Please get in touch with us for full pricing. We can usually get a quote to you within 24 hours.